The Treasurer’s Office works with district staff and the Board of Education to provide sound resource management and financial leadership for Pickerington Schools. The Board and the Treasurer’s Office are responsible for all fiscal operations of the district, including, but not limited to banking, investments, budgeting/appropriations, forecasting, accounts payable/receivable, payroll, tax receipts, bond issues, financial reporting, financial policy development, and Board minutes. 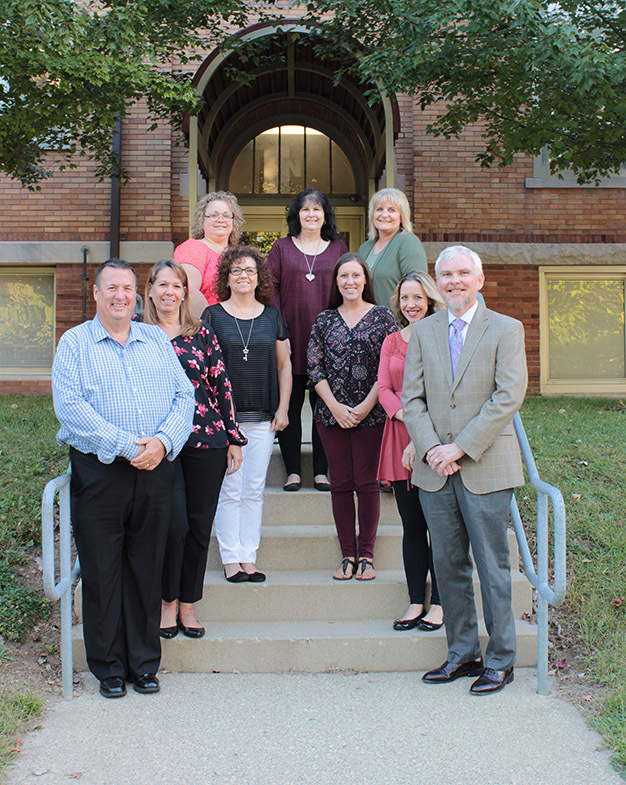 Information about the Treasurer’s Office team can be found on the Treasurer’s Office department web page. According to the Ohio Department of Education, “A forecast is somewhat like a painting of the future based upon a snapshot of today. That snapshot, however, will be adjusted and the further into the future the forecast extends, the more likely it is that the projections will deviate from actual experience. A variety of events will ultimately impact the latter years of the forecast, such as state budgets (adopted every two years), tax levies (new/renewal/ replacement), salary increases, or businesses moving in or out of the district. The five-year forecast is viewed as a key management tool and must be updated periodically. In Ohio, most school districts understand how they will manage their finances in the current year. The five-year forecast encourages district management teams to examine future years’ projections and identify when challenges will arise. This then helps district management to be proactive in meeting those challenges. School districts are encouraged to update their forecasts with ODE when events take place that will significantly change their forecast or, at a minimum, when required under statute. Interested readers can find more information about five-year forecasts on the Ohio Department of Education’s website. O.R.C. 5705.391 and O.A.C. 3301-92-04 require a Board of Education (BOE) to submit a five-year projection of operational revenues and expenditures along with assumptions to the Department of Education prior to Oct. 31 of each fiscal year and to update this forecast between April 1 and May 31 of each fiscal year. ODE encourages school districts to update their forecast whenever events take place that will significantly change the forecast. For Pickerington Schools, this forecast is required to consider the general fund and the other special cost centers associated with general fund money. Additionally, a small portion of Ed Jobs funding, which was provided by the federal government via stimulus funding, is also included for fiscal year 2013. The following definitions will assist readers as they read the assumptions to the forecast or take part in discussions about the forecast. Encumbrances – Money obligated to pay for any purchase. An end of year encumbrance is money obligated in the current fiscal year to be paid in the next fiscal year. Expenditures – The spending of any public money for a specified purpose as approved by the BOE policy and procedures. Fiscal Year – In education and state government, the fiscal year runs from July 1 through June 30, and each fiscal year is dated by the ending date. Example: FY12 would start July 1, 2011 and end June 30, 2012. Revenues – Receipts generated from property taxes, school district income taxes, state foundation formula, and local monies (such as donations, fees, tuition, etc.). Finally, since the preparation of a meaningful five-year forecast is as much an art as it is a science and entails many intricacies, it is recommended that you email Pickerington Schools Treasurer/Chief Fiscal Officer Ryan Jenkins, or call him at (614) 833-2110 to discuss any questions you may have. 2019 Tax Budget (effective for Fiscal Year 2020, from July 1, 2019-June 30, 2020): To be considered by the Board of Education on Wednesday, January 9, 2019. 2018 Tax Budget (effective July 1, 2018-June 30, 2019): To be considered by the Board of Education on Monday, January 8, 2018. FISCWeb provides customized reports for school districts. FISCWeb reports are published by ITC’s for districts that use state software. These reports run in batch overnight and provide up-to-date information about school district finances as viewed through the lens of departments, school buildings, student activities, etc. The level of stratification is customizable for each school. Please click on this link for a quick video/guided tutorial of FISCWeb for Pickerington Schools. After selecting an application selection, a separate page will open in your browser. Within that selection, the reader will see the schools and or departments (depending upon which selection is chosen) within that selection. For example, by clicking on Department Reports, the reader will see the additional choices below. Each department is also a hyperlink; when the reader clicks on one of those hyperlinks, the reader will see the different budgetary reports, in PDF format, for those departments. The following are a complete listing of the application selections, expanded to include all subcategories/reports contained within. Each expanded application selection contains links to the buildings and/or departments contained within it. Search audit reports for the district since FY 1999 on the Auditor of State’s website. Tips or complaints of fraud in Ohio’s governments may be made to the Ohio Auditor of State at any time by any public employee or private citizen. Fraud may be reported by using this website, U.S. Mail, the Auditor of State’s Fraud Hotline, and the Ohio Stops Fraud iPhone app. Visit the Ohio Department of Taxation website to view the “2010 Property Taxation and School Funding” document. This document provides an in-depth understanding of the property tax and its role in providing vital resources to school districts. Visit the Ohio Department of Taxation website to view the “School District Income Tax Question and Answer Guide for School Administrators and General Public.” This guide provides an in-depth understanding of the Ohio School District Income Tax. The Ohio Department of Education recently released the Pickerington Schools FY18 Financials. Follow this link to interactively view this data on the Ohio Department of Education web site. ODE is required to rank districts by the amount, and percentage, of expenditures on classroom instruction. For the 2017-2018 school year, Pickerington Schools spent 68.1% of operating expenses on classroom instruction ($6,520/pupil classroom, $3,053/pupil non-classroom). Pickerington Schools’ ranking for the 2017-2018 school year is 8th out of 15 districts in our comparison group. A look at our district expenditure report by building for 2017-2018 can be found here. Additionally, ODE ranks districts on spending and performance. ODE seeks to answer this question: what is the relationship of average spending per student to performance, and how does that compare to similar districts and schools? When compared to other districts in our comparison grouping, Pickerington Schools ranks 5th out of 15 districts with a Performance Index score of 94.2. The ODE website offers a table that shows what each category of expenditure means. It is also important to note that the new expenditure standards calculate both the “historical” expenditure per pupil (EPP) and the newer measure called the expenditure per equivalent pupil (EPEP). The rankings on the report cards are based on expenditures per equivalent pupil (EPEP). EPP is calculated by dividing total expenditures by ADM, where each student counts the same, whereas EPEP is calculated by dividing expenditures by weighted ADM, where harder-to-serve students can be given a higher mathematical weight. The weights are calculated in the same manner used for the fiscal benchmark report, to count as greater than 1.0 FTE students who are in special education, are economically disadvantaged, or are English language learners. Instruction. Activities dealing with the interaction of teachers and students in the classroom, home, or hospital as well as co-curricular activities. Includes teachers and instructional aides or assistants engaged in regular instruction, special education, and vocational education programs. Excludes adult education programs. Pupil support services. Expenditures for administrative, guidance, health, and logistical support that enhance instruction. Includes attendance, social work, student accounting, counseling, student appraisal, information, record maintenance, and placement services. Also includes medical, dental, nursing, psychological, and speech services. Instructional staff support services. Expenditures for supervision of instruction service improvements, curriculum development, instructional staff training, academic assessment, and media, library, and instruction-related technology services. General administration. Expenditures for board of education and executive administration (office of the superintendent) services. School administration. Expenditure for the office of the principal services. Operation and maintenance of plant. Expenditures for buildings services (heating, electricity, air conditioning, property insurance), care and upkeep of grounds and equipment, nonstudent transportation vehicle operation and maintenance, and security services. Pupil transportation. Expenditure for vehicle operation, monitoring riders, and vehicle servicing and maintenance. Other and non-specified support services. Business support expenditures for fiscal services (budgeting, receiving and disbursing funds, payroll, internal auditing, and accounting), purchasing, warehousing, supply distribution, printing, publishing, and duplicating services. Also include central support expenditures for planning, research and development, evaluation, information, management services, and expenditures for other support services not included elsewhere. Food services. Gross expenditure for cafeteria operations including the purchase of food. Enterprise operations. Non-instructional expenditures for business-like activities where the costs are recouped largely with user charges. Other elementary-secondary non-instructional. Expenditure for other elementary-secondary non-instructional activities not related to food services or enterprise operations. Community services. Expenditure for providing non-education services such as, operation of a swimming pool, public library, programs for the elderly, and child care centers. Adult education. Expenditures for basic adult education classes, such as GED or high school equivalency. Other non-elementary-secondary programs. All other non-elementary/secondary programs such as any post-secondary programs for adults. Construction. Capital expenditures for construction of fixed assets. Land and existing structures. Capital expenditures for the purchase of land and existing buildings and grounds. Equipment: instructional. Capital expenditures for instructional equipment. Equipment: other. Capital expenditures for non-instructional equipment. Payments to other governments. Category used only at statewide level. Calculations of EPP are also available on ODE’s website. For the pupil amounts, the district’s expenditures are divided by ADM (average daily membership), which is calculated from year-end student-by-student data reported via EMIS in period N. The students are counted by educating district or school, not resident district. FTE equivalents are calculated for students attending multiple schools, or partial year, or part-time status. Pre-school special education students are included, but other pre-school students and all adult education students are excluded. The calculations mirror the procedure for determining expenditure flow model (EFM) ADM calculations from past years. Why did my CAUV values increase so much? The following are effective December 21, 2017. The Pickerington Local School District Board of Education, through its designees, namely the Superintendent, Treasurer or Business Manager, hereby establishes the following list of items as having total fair market value of less than $2,500, and that such items are available for donation beginning on February 1, 2016: Textbooks, workbooks, notebooks, CDs, and worksheets in the core subjects of English, Math, Science and Social Studies. For more information, please contact Amanda Forsbach at (614) 920-6115. Any nonprofit organization desiring to obtain donated property under this notice shall submit a written notice to the Board or its representatives at the following address: PLSD Non-Profit Donation Program, Attention: Treasurer Ryan Jenkins. 90 N. East Street, Pickerington, OH 43147. The written notice shall include evidence that the organization is a nonprofit organization that is located in this state and is exempt from federal income taxation pursuant to 26 U.S.C. 501(a) and (c)(3) ; a description of the organization’s primary purpose; a description of the type or types of property the organization needs; and the name, address, and telephone number of a person designated by the organization’s governing Board to receive donated property and to serve as its agent. The Board shall maintain a list of all nonprofit organizations that notify the Board or its representative of their desire to obtain donated property under this division and that the Board or its representative determines to be eligible. The Board shall maintain and post a list of all school district property the Board finds to be unneeded, obsolete, or unfit for use and to be available for donation. This list shall be posted in a conspicuous location in the Board’s office, and continually on the Board’s web site. An item of property on the list shall be donated to the eligible nonprofit organization that first declares to the Board or its representative its desire to obtain the item.